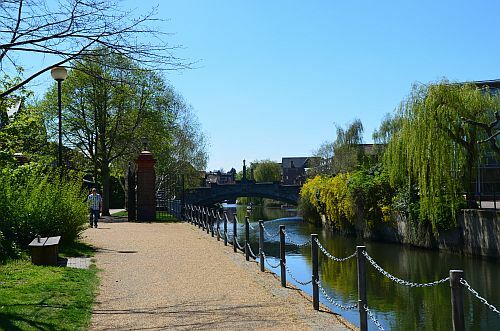 Norwich has been a city with a strong and inventive connection to books, writing and literature for a very long time and still is. 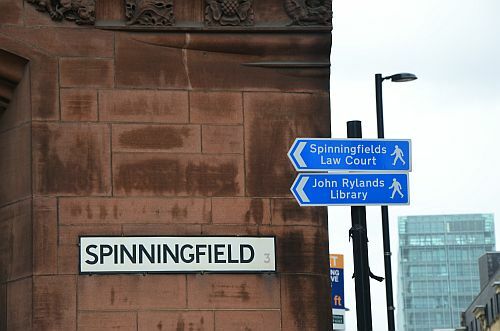 Its literary past has developed into a great number of institutions and events related to literature, which in 2012, won the city the status of England’s first UNESCO City of Literature. As far back as 1395 Julian of Norwich became the first woman to write a book in English. During times of war and plague her writings were telling of love and hope. In 1970 the first Creative Writing Master of Arts degree in the UK was founded at University of East Anglia with Ian McEwan being its first graduate. 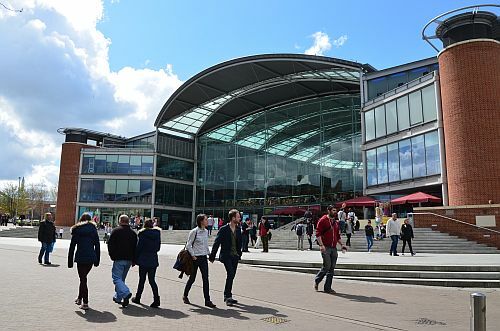 The vibrant literary community is constantly keeping in touch with contemporary needs and in 2006 Norwich as the foremost city in the UK joined the International Cities of Refuge Network, a worldwide net to give support to threatened writers and stand up for free speech. Apart from Ian McEwan there are a number of great names connected to Norwich and its literary life. W G Sebald founded the British Centre for Literary Translation, humorist Stephen Fry calls Norwich his home. And there are many more. In the late 90ies the then public library was badly damaged during a fire. 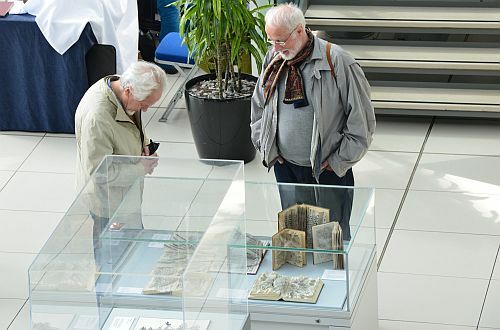 It was replaced by the Norfolk and Norwich Millenium Library, which quickly developed into the most-visited public library in the UK and has been so for the past 5 years. 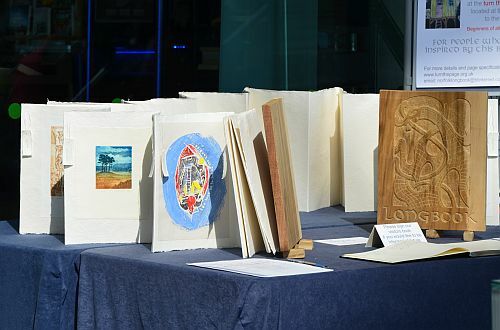 The Forum is right in the city centre and for two days in early May this year its entrance hall turned into a book art wonderland showcasing „books but not as you know them“. 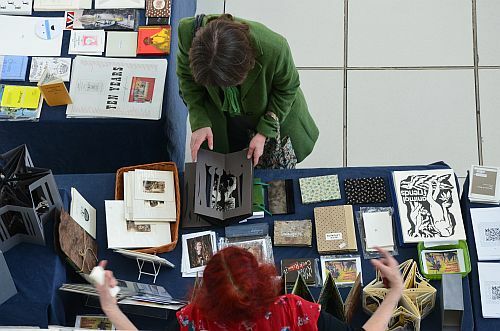 All book arts can give was present: altered books and zines, limited editions, typographic and illustrated artwork, sculptural books and installations, virtual and interactive works. 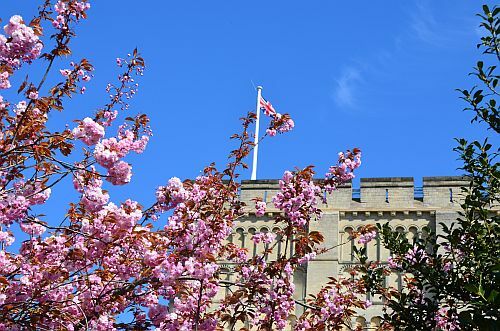 With spring at its best and the sun shining brightly from a blue sky, the cherry trees were in full bloom around Norwich Castle and elsewhere in the city – just everybody had a smile on their face. 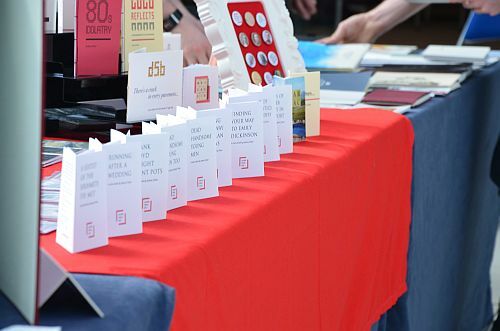 Alongside the fair the Norfolk Longbook was presented to the public. 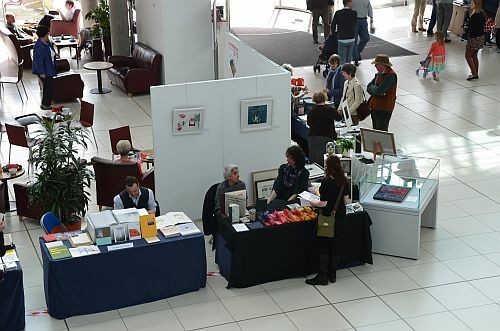 It is an ongoing community project with artists and authors contributing works related to or inspired by Norfolk. It is to become the longest book in Norfolk. 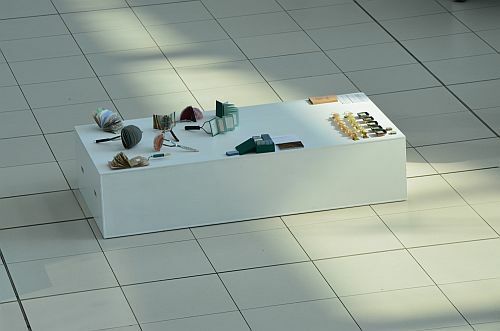 You can get involved by sending in Norfolk inspired work or join one of the special workshops. Check for dates and details with their website. We had a wonderful time in a wonderful place in a wonderful city with a marvellous weather. A huge thankyou to all of the team at ttp!
! June 7th talk+reading by Beau Beausoleil at the library – details at the end of this blog! We found ourselves a lovely B&B right in the middle of fields with horses grazing in the peace and quiet of the countryside on the Cheshire-Staffordshire border. After nearly two weeks of gorgeous spring weather with sun and blue sky wherever we went – be it Norwich or Chester – during this early May we watched a colourful sunset telling us the weather was about to change. We woke up to a cold morning with a rainy sky on May 9th. We could have left the car in Crewe and taken the train into Manchester but tried to find a Park&Ride in some of the outskirts of the city. We left the car in Trafford (the P&R there did only exist in the memory of our SatNav but we found a place for the car some yards down the road) and took the tram from Cornbrook into Manchester Victoria Station where free shuttle busses take you to a stop just opposite John Rylands Library. It was still raining but the building was none the less impressive. 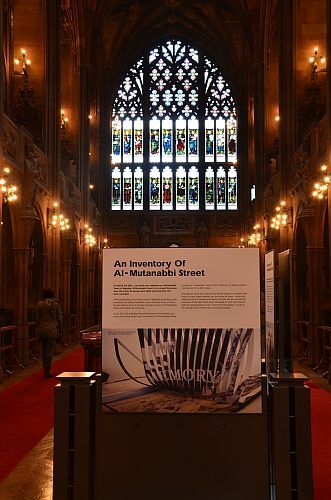 The exhibition of „An Inventory of Al-Mutanabbi Street“ spreads out on three floors with the major part in the Historic Reading Room, one display case on the ground floor café and a number of them in the little cloister. Entering the Historic Reading room from the far end makes you face it almost in its entire length with the stained glass window in the back far above your head. 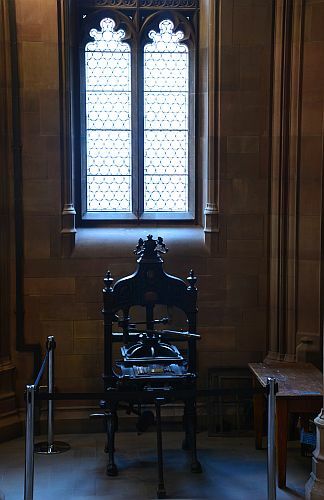 The stone masonry in the cathedral-like room is breathtaking. 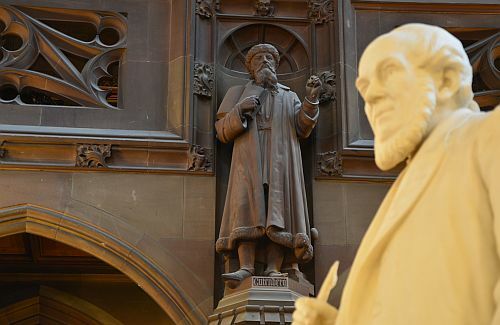 All the show cases are being watched by the statues of the famous of the past. Homer, Skakespeare, Newton – representing the cultural heritage and pursuit of knowledge ever since we learned to speak and write, thus literally reminding of what this project is about: Al-Mutanabbi Street Starts Here. 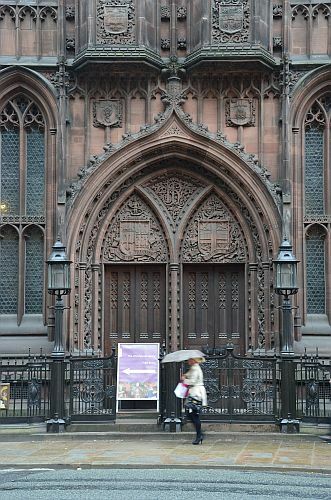 Stepping into the room and walking along makes you realise that his is not a cathedral but a library. On either side there are a great number of recesses which either are furnished with a table and chairs or with large card index boxes. 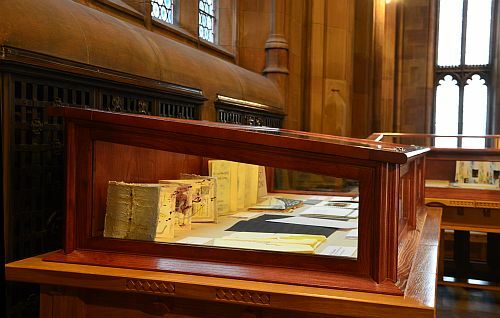 The walls of the recesses are covered from floor to ceiling with wooden shelves filled with books. Students have their laptops out on the tables working. The very specific quietness of a library in which work is being done sweeps gently through the room. 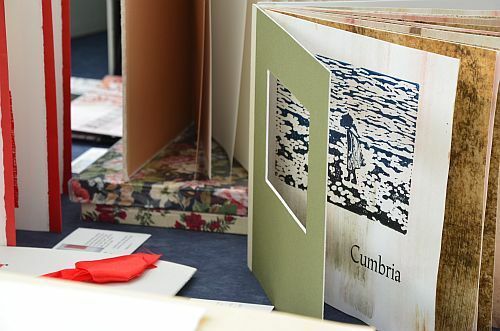 With respect to the copyright of the exhibiting colleagues you will not find any close ups of artist’s books on this blog. Of course you will have a much more intense experience of the books with being in the room and seeing them yourself. This blog is to say: It is more than worth while to go and see this exhibtion in this very special and extraordinary place. 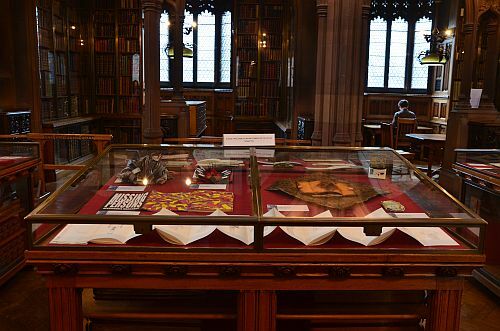 And when you’ve seen it all and taken in and are about to leave, before you step out onto the roads in Manchester again in whatever weather awaits you: when still in the library’s shop and facing the door, turn right and look for the donation box with Mrs Rylands having tea with the dragon. 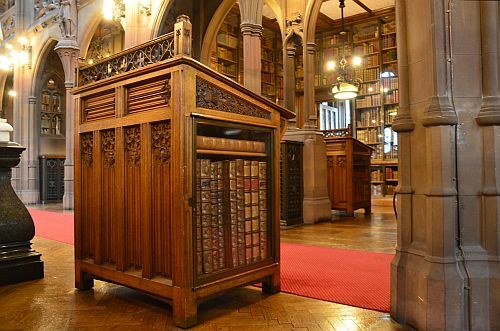 Go there, put in a coin or two and watch – it’ll make your day, if the library and the exhibition have not done so already. The exhibition will be on until July 29th. 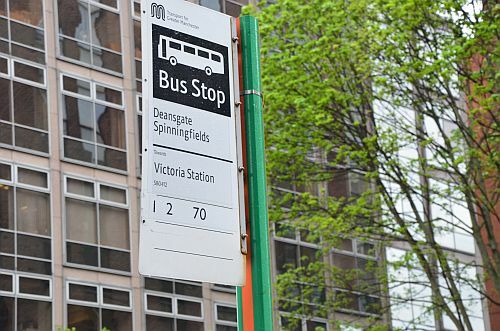 This is where you want the free shuttle bus to take you to: Deansgate, Spinningfields, John Rylands Library, it is the green line No 2 that takes you there from Victoria station. 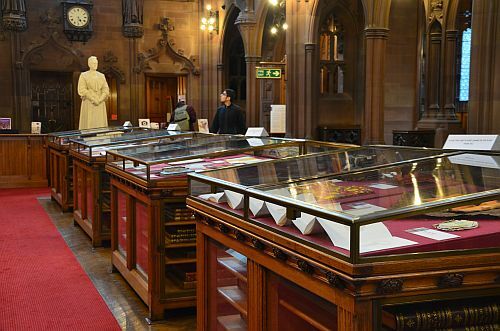 Beau Beausoleil, the founder of the al-Mutanabbi-Street coalition, will be at John Rylands Library speaking about the project and reading from the award winning al-Mutanabbi Street anthology. He’ll be joined by Sarah Irving, a blogger of the Middle East and North Africa. If you are anywhere near: don’t miss it!